I had a rough time studying Electrical Engineering. Linear Systems, an advanced EE course, was especially difficult for me. I remember studying all week for the midterm. Tim, the smartest kid in the class, was patient enough to study with me, since he knew I needed help. 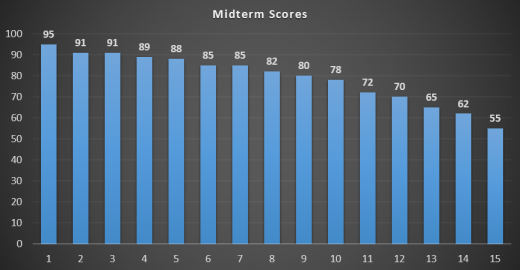 The week after the midterm, the professor showed a graph just like this one on the screen, with each number across the bottom representing a different unnamed student in the class. The value at the top of each bar shows what that student scored on the test. We students looked eagerly at the graph, guessing which grade was our own. Then we got our exams back. Take a guess which grade was Tim’s. Now, take a guess which one was mine. Go ahead and guess. Ouch. Another failure. Despite much preparation for this midterm, too! Let me remind you I had just spent the entire week studying with Tim, who understood Linear Systems better than any other student. I learned everything I did wrong on the midterm when I went to the professor’s office after class. I learned I need to develop better study habits. I learned I don’t understand Linear Systems at all. I learned Electrical Engineering is not the right major for me! It was a big day for me, even if it was a big failure. That day was the turning point of my academic career. No joke! I immediately dropped out of Linear Systems and changed my major to Computer Science. You may not see how one exam score led me to that conclusion, but I assure you it was not the first red flag. Looking back, I’m actually very glad I the midterm was a failure. I was very frustrated with my major previously, but that day brought tremendous clarity. That experience redirected me onto a much better path academically — thus affecting my career from that moment on. It is harder to learn from successes, because there is little feedback or criticism to learn from. You did great, even though you a couple tiny mistakes. Yay. Now let’s forget that and move on. Next! Conversely, failures are an excellent learning opportunity, for you can realize what you could have done better. Failures can uncover massive problems with your attitude, strategy, or even your perspective. Tim probably doesn’t remember learning anything about his success on that midterm — other than how I should switch my major, that is! But I learned quite a bit from my failure. Don’t be afraid to fail. Expect it to happen. Then, recover when it does. You will learn more from it than success. It might just take your life in a new direction, like it did mine. How much could you learn if you failed more?